Sri Ranganathaswamy Temple is an important shrine where it is believed that the Lord Narayana actually resides. Located at Srirangam in Tamil Nadu, the temple can be reached easily from Trichy. However, regular bus services and private taxis connect the temple from all the major towns and cities of Tamil Nadu. 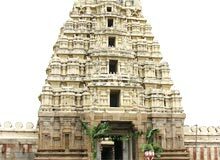 Sri Ranganathaswamy Temple is considered as the first and foremost amongst the 108 Divya Desams (Holy abodes) of Lord Vishnu.